Let me take my ‘professional hat’ completely off. I will keep both my ‘mom hat’ and my ‘athlete hat’ on while I write this post. 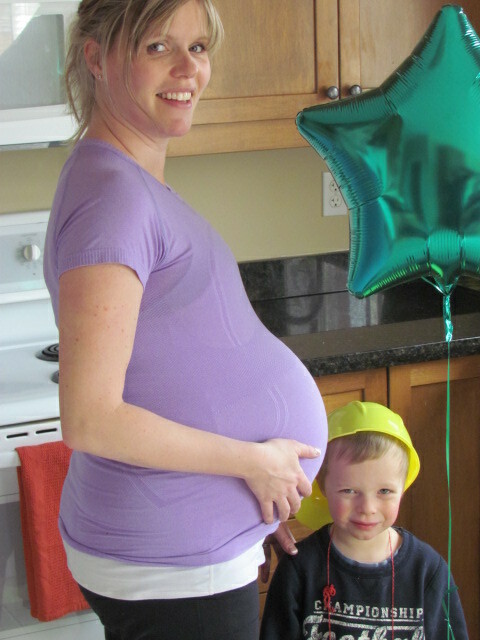 In 2008, I was pregnant with my son and continued to run until about a month before my due date. I am a runner, and so, I ran. I had lots of encouragement along the way- friends applauded me, family supported me, running partners slowed down for me, and people were generally accepting of my choice. The response was very different three years later when I continued to do Crossfit, my newfound love, during my pregnancy with my daughter. Aside from fellow Crossfitters, I found a hesitant, reluctant, skeptical response from others. Hydrate, hydrate, hydrate. And then hydrate again. Do not go breathless. I kept my workouts aerobic rather than the gasping-for-breath-wanna-puke-may-die anaerobic feeling I often get from non-pregnant Crossfit workouts. It seems to me that if mom is oxygen-deprived, then baby would be too. If it doesn’t ‘feel right’, don’t do it. For me, that meant no kipping pull-ups, no box jumps (I did step-ups instead), and no backsquats. They just didn’t feel right for me, for my pregnancy. Every situation is unique, every pregnancy is different, every judgement call is individual. Trust your body. Trust your baby. Pregnancy is not a condition or affliction, ailment or disability. It is a chance for you to give your baby the healthiest mother that you can. Make no mistake, labour, delivery, and recovery are physical events in which fitness can be a huge help. So should you continue to do Crossfit when you’re pregnant? Absolutely. Should you continue to run when you’re pregnant? Absolutely. Should you continue to swim and walk and do yoga when you’re pregnant? Absolutely. If you’ve been doing it pre-pregnancy, if you have a low-risk pregnancy, and perhaps most importantly, if it feels good to do so. On my due date in 2012: I did a ‘7-minutes-of-burpeess’ workout. I got 52. ***I understand that some mothers experience high-risk pregnancies in which exercise is not appropriate. I was lucky to have two uncomplicated, low-risk pregnancies, and the above post is based on my own personal experiences. It is not meant to be taken as medical advice. Always check with your midwife or doctor… but listen to your body too, you know it best. This entry was posted in Crossfit, Parenthood and tagged baby, crossfit, fitness, pregnancy. Bookmark the permalink.